This bracelet has Swarovski Amethyst Crystals, the clasps,silver beads, grow chain are all Sterling Silver. 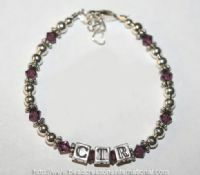 If you are looking for a Boys CTR Bracelet I can make these check out my boys bracelets. I can add CTR instead of their names. These bracelets will be $26.00 ea.